My daughter – a noisy little pipsqueak of a toddler – is quite the foodie Fauntleroy. When she’s not hurling her lunch to the floor (she is a notoriously picky eater), she’ll call out the names of middle-class foods while we scurry about trying to get her to eat. Which is much to our amusement and sometimes cringing embarrassment if we’re in public. ‘Saucisson!’, she yells, as her dad cuts into a stinky sausage from the farmer’s market. ‘Asparagus!’ she bellows, lobbing a buttery, green spear back over to me, untasted. ‘Want more ALMOND BUTTER’, she roars, as I sprint back and forth to the toaster. Another one she enjoys saying is ‘cornichon’. Which makes me titter. It seems a pity to me that in the UK, eating certain foods pretty much defines which social bracket you fall into. If you buy sourdough bread or smoked paprika, more often than not you’ll be automatically lumped into the middle class one, expected to be a reader of broadsheets, a wearer of Birkenstock sandals and perhaps sporting ironic facial hair. This sort of unhelpful stereotyping doesn’t appear to exist in countries like Italy, France or Spain, where the food culture is so strong that just about everybody is passionate about what they eat and there’s no social judgement attached to it – it doesn’t matter whether you’re a labourer or a lawyer; you’ll both be perusing the same cured meats at the market with equal scrutiny. I think it would be amazing if we could be less judgemental of what others eat – and that your child could yell ‘couscous’ or ‘baba ghanoush’ at the top of their lungs without being sniggered at (I admit that I’m guilty of doing the sniggering, too). But we’ve got a certain amount of catching up to do on the food front, having been in the culinary doldrums for decades after the war. The UK has made great strides in the last 15 – 20 years with all kinds of amazing regional produce coming to the fore, and food and farmer’s markets becoming a real focal point in lots of communities. I can still remember having my first taste of pesto sauce when I was a student, amazed that such flavours existed! I didn’t even taste fresh coriander until the early 1990’s; curries were a total game-changer in my twenties. 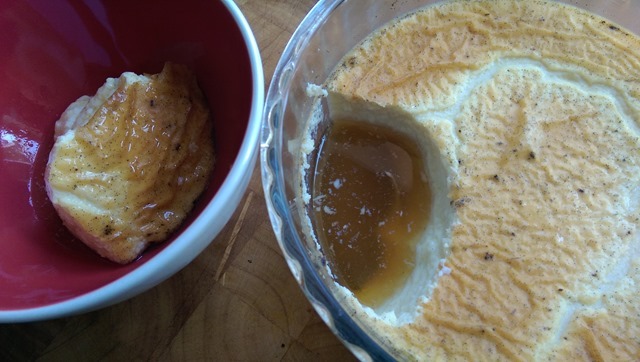 Anyway, here is my Mum’s delicious Crème Caramel recipe, which she made a lot for my brother and I while we were growing up and which I still make today. I can’t yet persuade my daughter to eat it (‘NOOOOO, Mummy!’), but that has no bearing on its deliciousness, as she’s a lousy judge of taste. It’s particularly wonderful eaten the day after you make it, chilled from the fridge. A lovely treat for a hot day, which takes about 40 minutes to put together. Preheat your oven to 150C. Put an ovenproof pudding dish in the oven to preheat. I use a very glamorous Pyrex bowl. First make the caramel. Using a heavy-bottomed saucepan (stainless steel if you have it), heat the sugar and the water together over a medium heat, stirring until the sugar grains dissolve. Then turn the heat up and watch it bubble until it turns a dark, coppery colour. Don’t continue stirring – this will make the caramel crystallise. 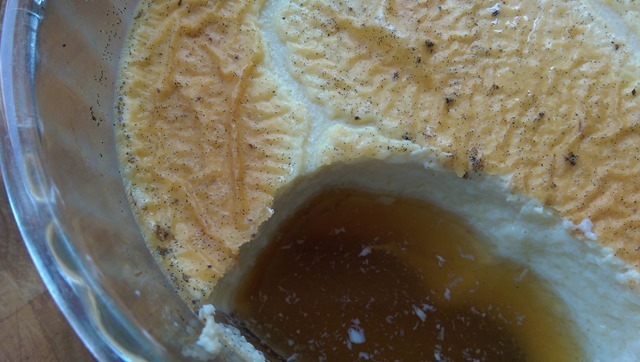 Be careful not to overcook it – caramel can burn very quickly. Quickly tip out the caramel into the preheated pudding dish and put to one side to cool down so that the caramel hardens. To make the crème, beat together the sugar, eggs, vanilla extract, vanilla seeds with a hand blender until well mixed. Heat the milk gently in a separate saucepan until it’s just hot enough that you can dip your finger in without burning it. Pour the milk into the sugar, egg and vanilla mixture, whisking constantly. Then pour this mixture on top of the caramel in the pudding dish. Boil a full kettle. 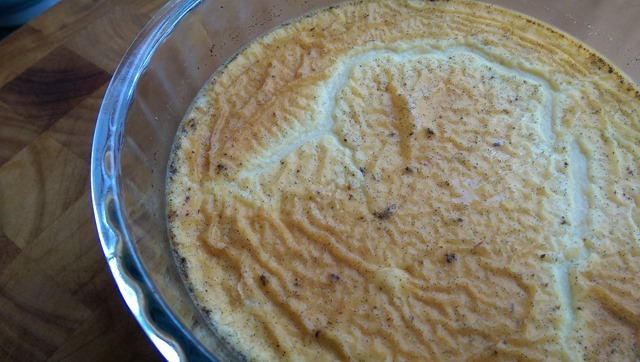 Put the pudding dish into a roasting tray in the oven, then fill the roasting tray with boiling water – enough so that the mixture reaches halfway up the pudding dish. This creates a ‘bain marie’ to evenly cook the custard. Bake for around 45 – 50 minutes, until there is a still a good wobble to the custard, but that it’s not too juddery. You can eat the crème caramel warm, but I prefer to chill it and eat it cold several hours later. You scoop out the custard to reveal a lake of beautiful liquid caramel at the bottom of the dish, which you can spoon over individual portions. You could bake this in individual ramekins and cut down the cooking time in the oven – but I can’t be arsed with the extra washing up! My daughter is obsessed with capers, probably because they’re the saltiest things she can get her mitts on. She literally eats them for breakfast. Aw that’s cute! And SO middle class! This made me chortle. Asparagus is one of the three green foodstuffs that Isaac will (sometimes) deign to eat – the others being frozen peas (natch), and samphire! How’s that for foodie fauntleroyness? samphire?! That is VERY aristocratic! All hail the king! Hilarious that Isaac will eat samphire! I doubt even Annabel Carmel has thought of that one. Actually, she probably has. She probably makes ‘samphire and watercress ice lollies’ or something.